Part VI Update on NYC’s Redesign Of Washington Square Park — The Corner “plazas” and … Conservancy? 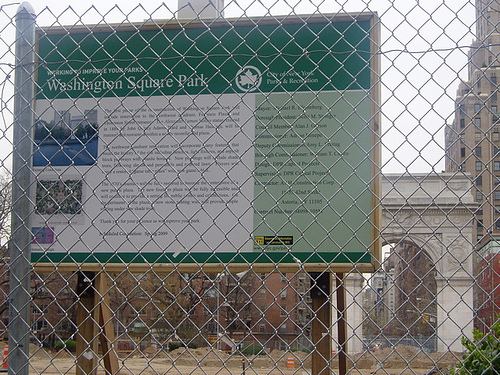 This photo captures a portion of the redesign of the North West corner of Washington Square Park with its “historic plaza” in the background. The problem with the Plazas (which will inhabit each corner of the Park) is that they are a decent size but not that large and then the re-designer places a huge flower bed in the middle. What happens then? It changes the whole flow and interactions of people within the park. Plus a considerable reduction in the public space. This is an issue I raised at the Washington Square Park Task Force meeting of Community Board 2 and local elected officials such as Council Member Alan Gerson, Speaker Christine Quinn and Assembly Member Deborah Glick, among others, who sent “representatives.” The Task Force then submits meeting notes to the New York City Parks Department with their questions and concerns and awaits feedback. My concern with the Task Force is they have not been strong or vocal enough with their questions and concerns and mandates. The WSPTF can weigh in on the size of the flower beds, the plantings, the size and location of the pathways, the design, the amount of public space – significant items. A big question in relation to Washington Square Park is whether — in order to upkeep the extensive redesign work being done and pay for future Phases — New York City will install a Conservancy for the Park. The Conservancy model is another one of the City’s (and Mayor Bloomberg‘s) favored public-private partnerships. In reality the Conservancy becomes the arbiter of the space. These are our public parks and they need to remain public. Especially Washington Square Park. See Parts I-V if you are just catching up(go to Key Posts on right sidebar). Click here for Part VII. Politics as Puppetry Blog attended WSP Blog’s Walking Tour this past Sunday, July 27th. The tour, “Washington Square Park – Past, Present and Future: A Guide to NYC’s Redesign of a Perfect Public Space,” is an initiative of this blog and the Washington Square Community Improvement District(CID). Politics as Puppetry gives a report back on the Walking Tour! There’s great photos and commentary which help put the pieces of the redesign together (while still leaving a lot of questions about the “why” factor). “SQUARE: Straightening Out Washington Square Park” is a one hour documentary which focuses on the redesign of Washington Square Park and what’s taken place over the last four years: how the Bloomberg Administration pushed through its agenda to get this famous park in ‘line’ – literally. It begins with the fountain, that famous theatre-in-the-round, home to political protest, art and musical freewheeling. The new design calls for this structure to “align” with the historic Arch (after over a century unaligned), more “picture perfect” for tourists traveling down Fifth Avenue, and reduction of the voluminous public space that surrounds it transformed into quaint areas with landscaped lawns. The film shows the government’s bait-and-switch games with the outraged community, whose members watch the City attempt to transform the Washington Square Park that they know and love into one that is pretty and pacified and far from its artistic, bohemian roots. 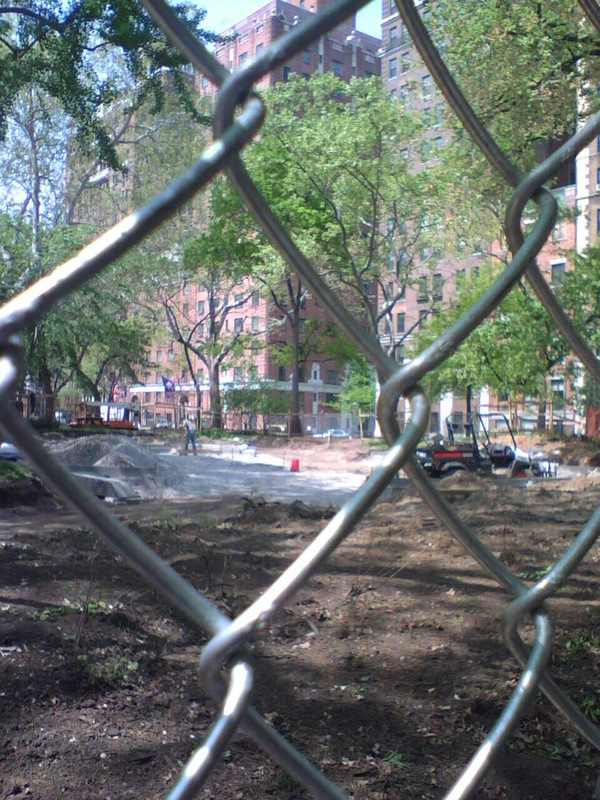 If you’ve been wondering how it got to this – with much of Washington Square Park behind gates and bulldozed – “SQUARE: Straightening Out Washington Square Park” will bring into sharp focus what’s happened thus far and what’s in store. This is the premiere screening of this documentary. Directed by Matt Davis. This SUNDAY, JUNE 1st, 7 p.m. There will be a “historic plaza” at all four corners of the redesigned Washington Square Park. I watched the workers working at the corner spot at Waverly and Washington Square West a couple of weeks ago and they were digging up dirt and pouring it on living plants. I found that a bit puzzling to say the least. Also, the care being given to the living trees with the construction swirling around them is of great concern. Wednesday’s (5/14) NYU graduation ceremony attracted widespread media attention because of graduating student William Lopez’s attempt to run all the bases at the venue, Yankee Stadium. The Daily News somewhat mildly cites “ongoing construction” as the reason NYU had to switch to Yankee Stadium after 32 years of graduation ceremonies at Washington Square Park. 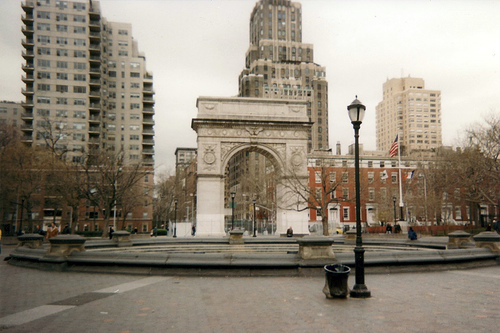 The photo above shows Washington Square Park set up for NYU’s graduation ceremony in 2006 — before the trees were cut down, the fountain dismantled, the Arch was behind gates. 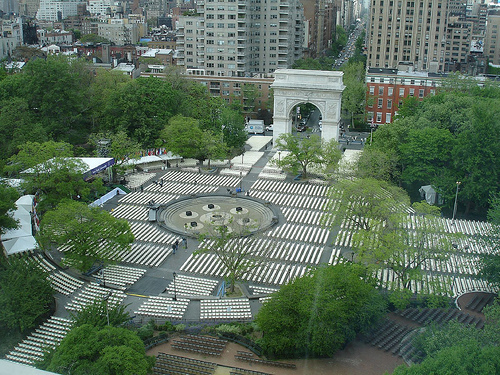 I have no attachment to NYU utilizing Washington Square Park for their graduation. The University uses the Arch, the Park, Washington Square when it suits them, as p.r. and in all their advertising, while they crush every other historic Village building in their path to erect more dorms and monstrous structures. There are many theories linking NYU and the “renovation” (read: redesign) of Washington Square Park. 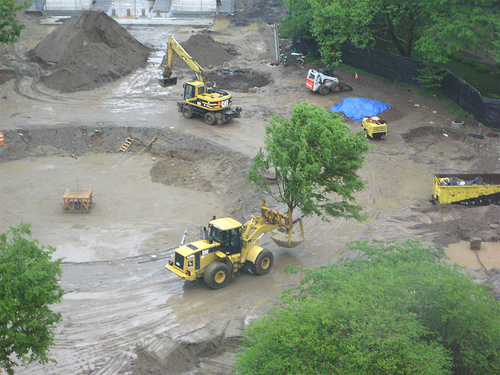 Some assert that the “ongoing construction” is very much about making the Park more “picture perfect” for … NYU’s graduation ceremony. The University clearly has no sense of humor or spontaneity — they barred Lopez from attending a post-graduation event at Madison Square Garden. I’d like to propose that NYU continues using Yankee Stadium as their graduation ceremony venue for the next 32 years. Since Yankee Stadium owners (also with the complicity of New York City government) crushed two parks in the Bronx for their own “reconstruction,” it would be much more fitting that these two corporate behemoths utilize one another. That is a 66% reduction in Parks Department workers. Since so much has been willingly privatized (by the City), it’s hard to know what the actual number of workers is now. 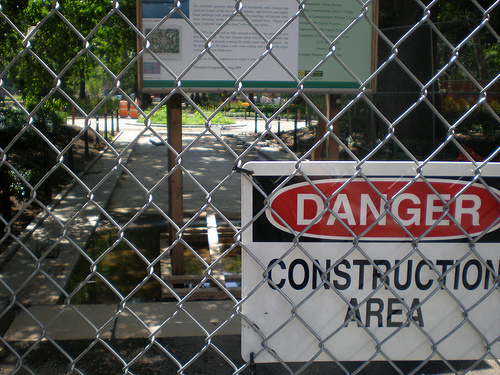 Another result of the reduction in the Parks Department budget and the City government’s focus on privatization of our public spaces is that private entities manage the space and also deem how that space is used. The Parks Department accepts a $7 million “anonymous” donation with STIPULATIONS – strings attached – that this donation ensures that there is a private restaurant in the historic Pavilion at Union Square. Although it hasn’t been revealed who the donor is, somehow restauranteur Danny Meyer, who is also co-chair of the Union Square Partnership (the local BID-business improvement district), is the only name bandied about as the choice to helm the restaurant. You can see how much of a slippery slope this whole privatization game is. Spring in Washington Square Park – The Park is Bustling. What Happens Next? There’s something about the spirit of Washington Square Park that even now, despite virtually HALF of the Park being closed for the City’s “renovation,” the open space is still filled to the brim with people commingling, creating music, art and conversation in new locations. (There’s no choice as the Fountain, its Plaza, and the Arch are behind gates and off-limits). Interconnections happen at Washington Square Park in ways that just do not happen in other spaces. That is why it is such an internationally known, perfect public space. The City’s redesign plans don’t take this into account. Their aspiration is to create a Park that is prettified and glossy and passive. The areas at Washington Square Park where people are gathering now – the north east corner by the picnic tables, the Garibaldi statue, the teen playground – those areas will all be REMOVED with the completion of the City’s redesign plan. In the North East corner (well, in every ‘corner’ of the Park), there will be a “plaza.” What that means I am not quite certain but the significance of that is – without question – a diminishing of the public space. The Fountain and the surrounding Central Plaza – the premiere area where people gather at the park – are scheduled to be reduced 23 percent. How is this allowed to happen? At Union Square Park right now, it’s a familiar drama that is being enacted. Some of the same actors, slightly different script, same basic plot, all being pushed through by Mayor Bloomberg and the City’s Parks Department — in the interest of privatizing and reducing the public space. If this is troubling to you, you have to something to say, join us Friday at Union Square Park from 6-8 p.m., pick a Park in the City to represent, create some art, make some music, dress up.